Arlington, VA (October 18, 2018)— Comfort for America’s Uniformed Services (Cause) today announced Lee and Penny Anderson, philanthropists and owners of APi Group, Inc., as the winners of the 2018 London Medal for Distinguished Service. 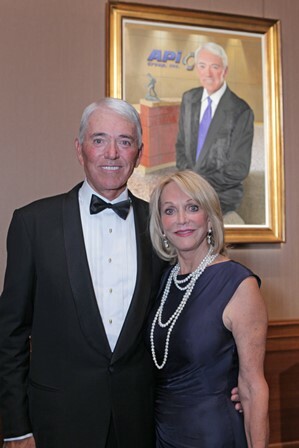 Lee and Penny Anderson have a distinguished record of philanthropic leadership and community involvement that significantly impacts US service members, veterans, their caregivers and families. Their company, APi Group Incorporated, earned the Military Friendly Employer Award for its hiring, training, and support program for veterans and wounded warriors. The Andersons were also instrumental in founding the Defenders Lodge in Palo Alto, California, providing temporary housing for Veterans undergoing extensive treatment or recovery at the adjacent Veterans Hospital. The Lodge serves as a national model for public-private partnerships and Defenders Lodges across the country. In 2011, the Andersons helped to establish the US Chamber of Commerce Hiring Our Heroes Program, a nationwide initiative to help veterans, transitioning service members, and military spouses find meaningful employment opportunities. They have supported numerous programs, projects, and activities at the US Military Academy at West Point, providing substantial support to the ongoing professional development of future US Army leaders. For their vision, dedication, and support to our Military, its leadership and legacy, and numerous organizations serving our wounded, ill and injured service members, the Cause Board of Directors awards The London Medal to Mr. Lee R. Anderson and Mrs. Penny Anderson. The London Medal will be presented to the Andersons at the Cause Annual Veterans Day Benefit Gala on November 10, 2018 at the Army Navy Country Club in Arlington, VA. The purpose of The London Medal is to recognize exemplary, distinguished service and continued support of wounded, ill and injured service members, their families, and those supporting their recovery. The Medal highlights a record of service and noteworthy achievement in advocating for the needs of those undergoing treatment and recovery. The award is presented to an individual, organization, or group that has made significant contributions to improving the quality of life and long-term outcomes for those who serve. Named in honor of Dr. Jennifer Burkhart London and Dr. J. Phillip London to recognize their personal and professional commitment to serving our community, our nation, and those in uniformed service.